Looking for lots of fun for the whole family? 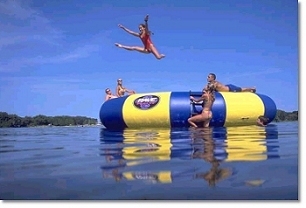 Our water trampoline is good for 1-6 persons. Rates are $25 for 1/2 hour or $40 for 1 hour. Need more time? Give us a call and we'll give you a great rate! Check out other local attractions. I haven't had so much fun in years! The crew were very friendly and eager to get us out on the water. The Jetskis were like new, and a lot of fun to ride. We had so much fun!! !